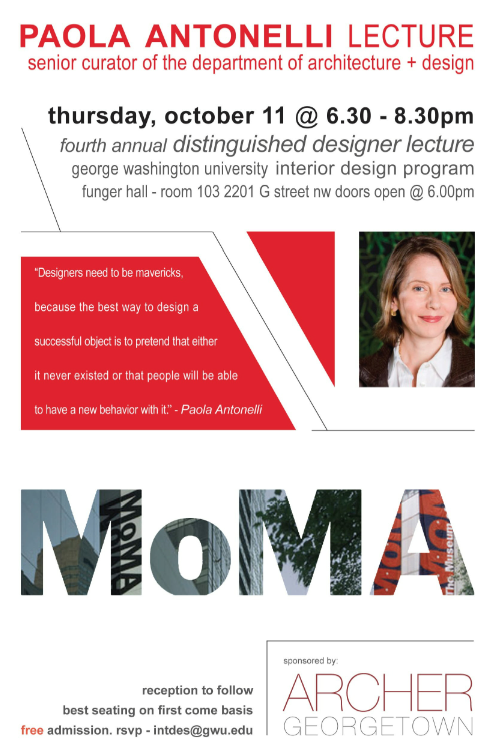 Join ARCHER & George Washington University Interior Design Department Thursday, October 11th from 6:30-8:30PM as Paola Antonelli, Senior Curator at MoMA, speaks in the fourth annual lecture series by GWU Interior Design Program. ARCHER is proud to be the exclusive sponsor for this highly attended event. Seats are on first come, first serve basis! Doors open at 6PM. This is the fourth lecture in a series of annual events GWU Interior Design Program brings to Washington DC. The lectures focus on design, innovation and architecture. Passed events have included notable speakers Vicente Wolf, Karim Rashid, and Gisue Hariri.